From the moment you enter Rebecca Kuhns’ shop on East Chapel Hill Street in Durham, it is clear that this is a boutique for the thinking woman. Mixed in with the array of hip, vibrant clothing are ethically made housewares and a shelf of literary and political books – among them Isabel Wilkerson’s The Warmth of Other Suns and Ta-Nehisi Coates’ Between the World and Me. This store is owned and run by women who are as smart and sharp as the clothes they sell – and that is exactly the kind of woman they cater to. Rebecca Kuhns stands outside Liberation Threads with messaging we love! Image from LT's Instagram. Kuhns is passionate about helping women lead more beautiful and rewarding lives, a passion she was able to fulfill for many years as a physician. But Kuhns is also passionate about Durham. And fashion. And because her undergraduate work in international Political Science made her acutely aware of the way global capitalism is stacked in favor of the big players, Kuhns has also become passionate about ethical fashion. But finding great clothes that meet the standards of fair trade is surprisingly difficult. So, last year, when Kuhns came to a crossroads in her career, she decided to help women create beauty and joy in their lives in an entirely different way – by giving them access to clothes that make them feel beautiful, without the guilt. 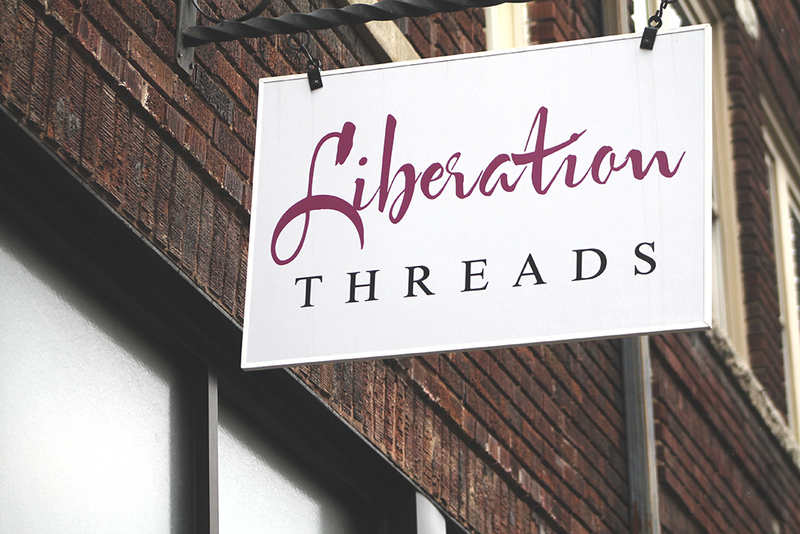 Liberation Threads is a pioneer, one of the Triangle’s first brick-and-mortar ethical fashion shops catering to fashion conscious women who want to look great but still shop their values. Kuhns felt that Durham was ready to support this kind of shop and the movement behind it. Judging by the community’s response to Liberation Threads, it seems like she’s right. These days, the default in the garment industry is to make clothes as cheaply as possible. Here’s what that means: unless a company is being very clear about supply-chain transparency, chances are that people are being exploited along the way. Liberation Threads only carries brands that offer transparency throughout their supply chain. To name a few – Mata Traders, Symbology, Passion Lilie, Liz Alig, and Global Mamas (a non-profit with the mission of empowering women and making a worldwide impact on poverty). Many people mistakenly assume that buying ethically – whether it’s clothing, homegoods, or even food – is a more expensive way to shop. Happily, this is not always the case. For less than $100 per garment, you can buy well-made, stylish clothes made by people who earn a living wage. Right now, Liberation Threads is carrying a gorgeous, gracefully draped red tunic (printed with marching white elephants!) 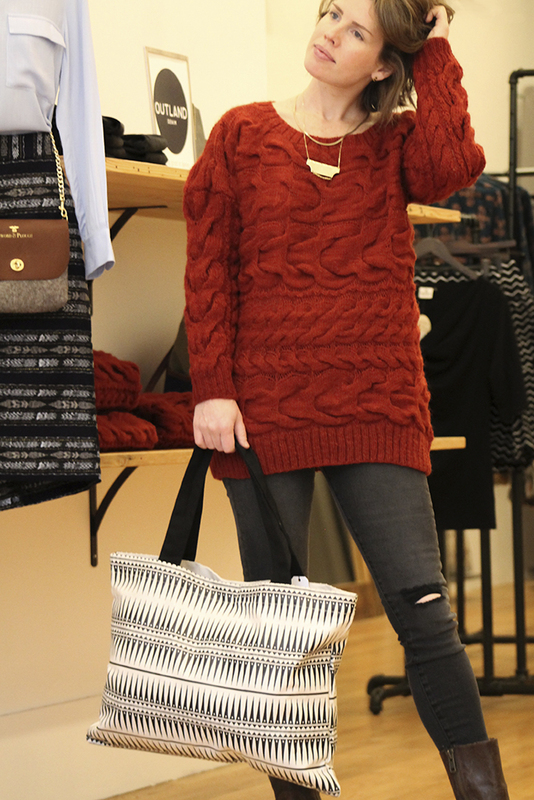 from Symbology for $70, and hand block-printed scarves from Passion Lilie for $20. Liberation Threads is mostly about clothes. Really beautiful, ethically made, globally conscious clothes that are smart and bright both in origin and in actuality. And yet Liberation Threads is about supporting the community (each month, 5% of weekday sales go to a local non-profit) and raising consciousness about global issues. Want to educate yourself further on ethical standards within the garment industry? Check out the Why This Matters page on Liberation Threads Website. Want to learn more about fair trade in general? Check out the World Fair Trade Organization’s Ten Principles of Fair Trade. Find your favorite brands on Project JUST to see how their ethics stack up (you can search 3 brands free each month). Some issues include: transparency, labor conditions, and environment. Browse Bead and Reel for curated ethical fashion and stay in the loop with their blog. Learn about Durham native Rebecca Ballard's socially conscious line of women's wear, Maven Women, and their mission to empower women to choose sustainable, ethically manufactured garments. Previous ethical fashion blog posts: The Real Cost of Buying Pink & Style Saint: Ethical Fashion.